One of the joys of being a PC gamer is having freedom to tweak your experience so it is just that much more pleasurable. I prefer not to alter the story or rules with my mods - I want the first playthrough at least to be true to the designers' intentions - but I have no qualms making some serious cosmetic changes. Try as designers might to make a perfect game, there are always a few issues with the graphics or interface that either looks wrong or is just damn frustrating to use. Why play with tools that don't work for you if you have the ability to edit them? Skyrim is a game I'll be playing for a long, long time, so I spent some energy this weekend making sure it looked and played exactly the way I wanted. Now, it must be said, I just got into modding my Skyrim experience, preferring to play a bit with the original game to see what I liked and what I didn't. I've tried out a bunch, but here are the three mods I've kept installed on my machine. This is not an exhaustive list - there are tons of well-written mods out there and when the Creation Kit comes out there will be even more. I'll be diving more heavily into the Skyrim modding community over the next few weeks and reporting on more awesome mods for you guys. Look for more mod round-up articles in the future. For now, feel free to suggest more mods to try in the comments, and if you haven't yet branched into modding your PC copy of Skyrim, here are some great tweaks with which to start tweaking the game to be that much more awesome. 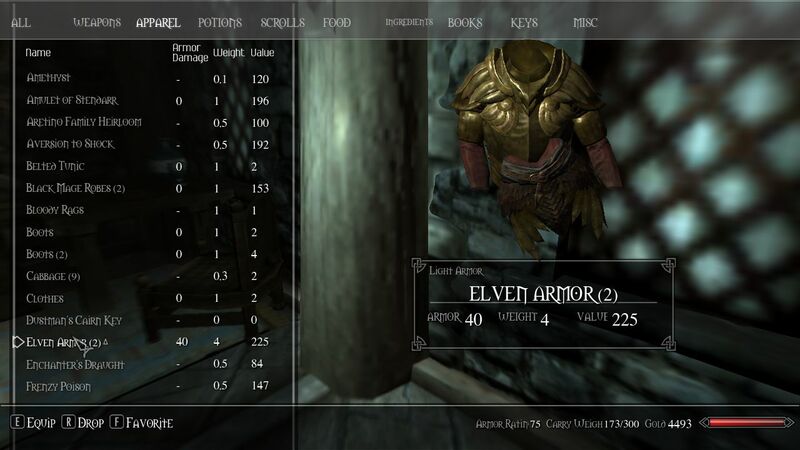 The inventory menu that shipped with Skyrim is just terrible. If I'm going to have an abstract list of all the stuff in my bags, I want that list to display as much information as possible. 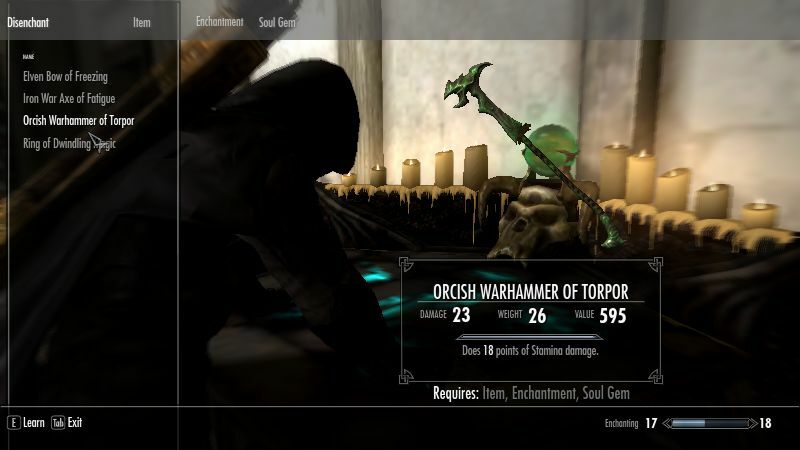 One of the first mods I looked for was something that made the inventory actually useful, but once I found QD Inventory Mod by Roltak, my search was complete. Once you put these files in the correct folder (follow the install directions, nooch), the inventory magically becomes a sortable table with columns displaying the most relevant item stat (armor, damage, etc.) as well as gold value, weight, and - my absolute favorite - value over weight. That last column (not pictured in the screenshots) is super handy in the bottom of a dungeon when you need to grab the important 5 lb. quest item and only want to ditch the least valuable, heaviest thing you've got on you. 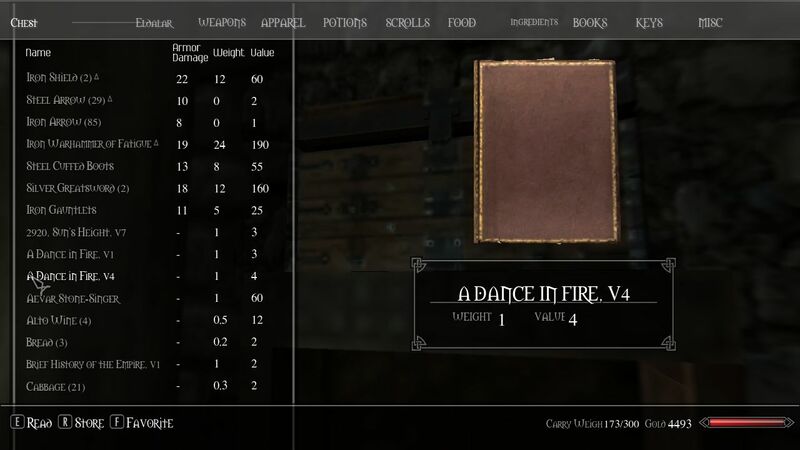 QD Inventory also alters the enchanting and alchemy interfaces a bit to match the changes to the inventory menu. There still are a few bugs that Roltak needs to iron out, including a weird display issue in the enchanting window, but overall QD Inventory has made my life in Skyrim about 37 times more enjoyable. 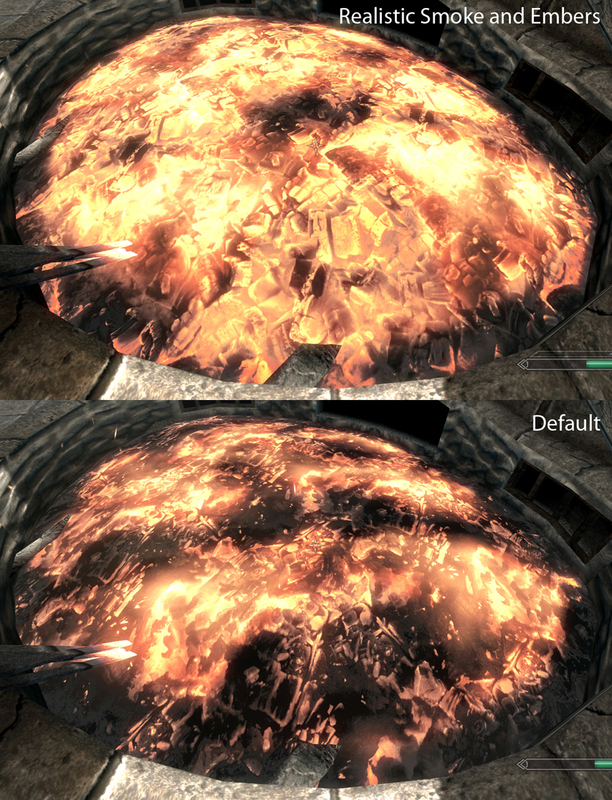 I like the addition of mining and smelting in Skyrim. Smithing makes so much more sense when you are gathering resources from the world. The problem, at least for me, is that the ore veins scattered throughout Skyrim are a little hard to see - especially if you play the game with the alpha settings tuned to provide real darkness when you are deep in a dungeon. Yes, you can give a torch to your companion or cast Magelight every minute while exploring, but I found that Glowing Ore Veins is a great convenience. Author Baratan added a glowing texture map to every vein of ore in the game, making them a cinch to spot even in total darkness. 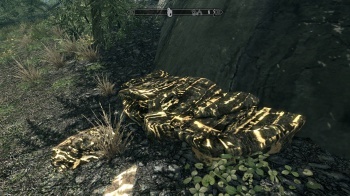 You'll never miss a vein of gold or corundum or ebony after you install Glowing Ore Veins on your machine and venture in the dungeons of Skyrim, notched pickaxe in hand. As I mentioned in this week's The Escapist Podcast, I'm playing a fighter/mage who wields a sword in one hand and a flames spell in the other. 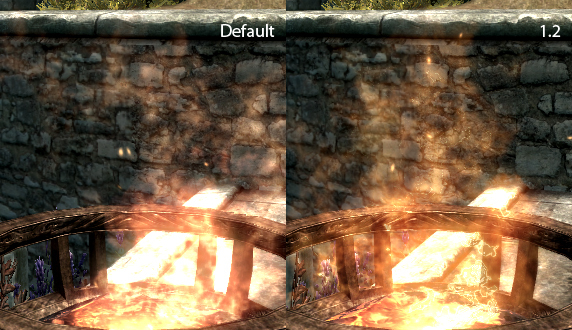 I thought the fire effects in the vanilla game looked fine, but after installing Isoku's Realistic Smoke and Embers, I realized that I was living in the dark ages. The blasts of flame shooting from my left hand somehow appear more lifelike with the smoke and floating embers perfecting the illusion that I am become Death, destroyer of worlds. 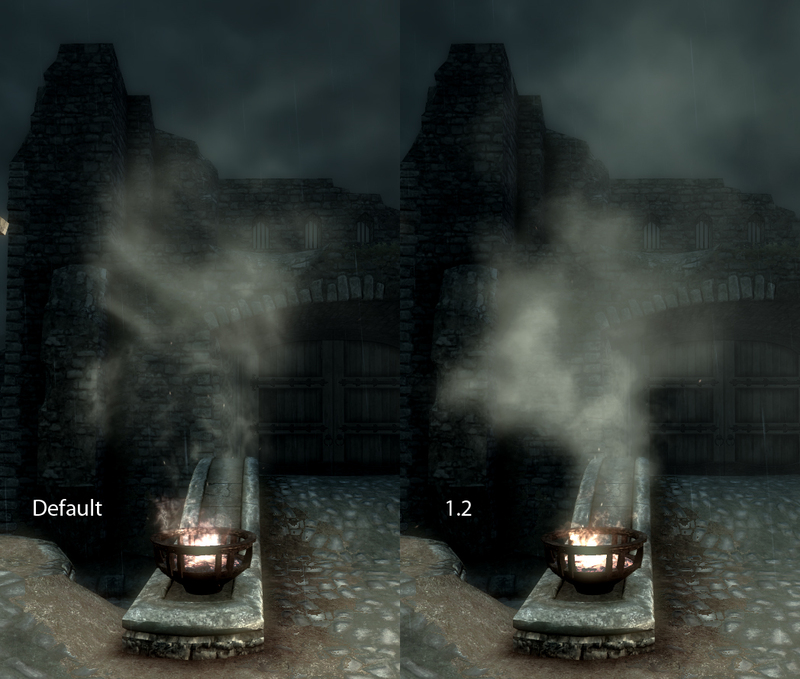 Ok, the alterations to the how smoke appears isn't that much different, but Isoku's mod gives the fires in Skyrim just enough more detail to enhance the experience. I have a bunch more mods on my list to try out. 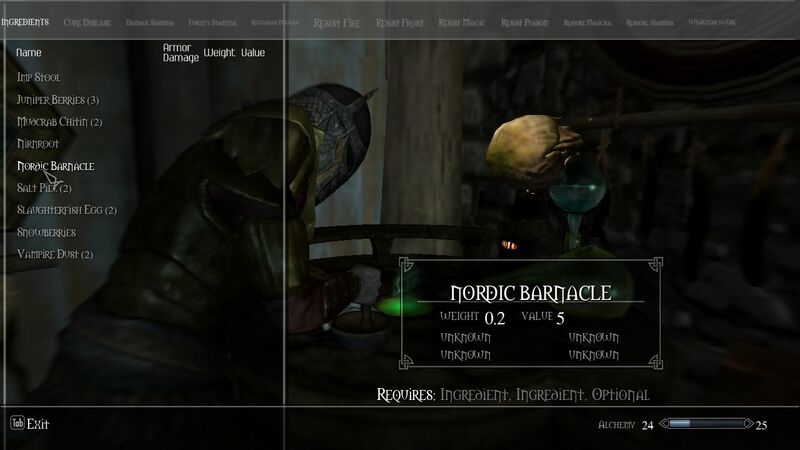 Mod author Kenney's KenMOD Item Icons looks really useful to quickly distinguish weapon type with an icon, and his Loading Screen Time puts a real-time clock on all loading screens - along with some other stats like level percentage - in case you have problems playing Skyrim way past your bedtime.